Indianapolis 500 veterans Lyn St. James and Sarah Fisher are returning to race in this year in the featured Indy Legends Charity Pro-Am on Saturday, June 16 during the Brickyard Vintage Racing Invitational at the Indianapolis Motor Speedway. Fisher won the A-Production class last year during her inaugural outing in the Sportscar Vintage Racing Association (SVRA) event, and St. James prepares for her fifth Pro-Am on the 14-turn, 2.439-mile road course at IMS. St. James, a seven-time starter in the Indianapolis 500 and the event’s rookie of the year in 1992, raced in 15 Indy car races in her career. While many fans know her best for her Indianapolis 500 achievements, she is an accomplished road racer and has earned numerous laurels at the wheel of a variety of race cars. She is a two-time competitor in the 24 Hours of Le Mans (1989 and ’91). She was even more successful in 62 IMSA GT events, amassing a record of six wins, 17 top-five and 37 top-10 finishes. Her 1985 GT victory at Watkins Glen remains the only time a woman has scored a win in that series driving solo. St. James also raced in the 12 Hours of Sebring nine times, winning the GTO class in 1990, and was a two-time winner in the GTO Class at the 24 Hours of Daytona. She raced in 53 Trans Am races with seven top-five finishes. Fisher is a veteran of nine Indy 500s, more than any other woman. She also was the first woman to compete full time in the IndyCar Series. Fisher earned standout results as the first woman to earn a pole position and the first woman to finish on the podium. Fans voted her the IndyCar Series’ Most Popular Driver for three consecutive years, 2001-03. Ohio native Fisher enjoyed early success, winning championships in karting and quarter-midgets. She climbed the ladder of midget and sprint cars, including World of Outlaws. After her driving career, she became the first woman to own a full-time Indy car team in 2008 and scored a victory with driver Ed Carpenter in 2011. In addition to the Pro-Am, there will be a festival of other activities at the Brickyard Vintage Racing Invitational, including the Sunday, June 17 feature race by the professional Trans Am series headed by 2017 champion Ernie Francis Jr. The weekend also presents the Hagerty Insurance “shine and show” car corral, vintage motorcycle racing, and 500-plus vintage racers ranging over 100 years of automotive history racing in SVRA Groups 1 through 12. An oval exhibition featuring a race car show of judged competition for the A.J. Watson and Sir Jack Brabham trophies led by track historian Donald Davidson also will take place. Also, the Pre-1920 Race Exhibition cars will be on track along with a paddock area full of in-period equipment displays. The National that finished seventh in the first Indianapolis 500 in 1911 will be driven at speed. 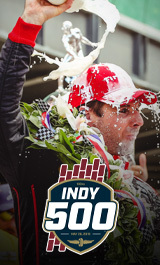 Visit IMS.com to buy tickets or for more information about the Brickyard Vintage Racing Invitational. Fans 15 and younger are admitted free when accompanied by an adult general admission ticket holder.